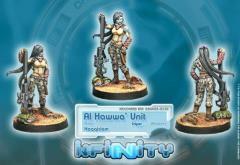 The Al Hawwa’, or Snake Charmers, are the secret security service of the Qapu Khalqi spaceships. Hidden amongst crew members or passengers, they always attack by surprise. This camouflaged infiltrator is a dangerous marksman and the spearhead of both the Qapu Khalqi, the Sultan’s Sectorial army, and the greater Haqqislamite forces.